The movie His Girl Friday is a comedy staring Cary Grant. In this movie Grant is the editor of a local paper named Walter Burns. His finds out that his ex wife is about to marry the star reported Hildy who is a star reporter at the paper is about to marry an insurance salesman Bruce Baldwin. Walter is not happy about this and comes up with a plan to try to stop the wedding. He asked Hildy to cover the execution of a convicted murderer. In addition to this Walter tries everything he can to keep the wedding from happening. He comes up with several plans that get Bruce arrested time and time again. He even kidnaps her future mother in law. Hildy is too busy with her work to notice Bruce or his plots to stop her wedding. Before the execution happens Walter and Hildy undercover that the Mayer is allowed the execution for publicity. They are able to uncover this just in time. Walter and Hildy plan on getting remarried but not before covering another big story on their way. 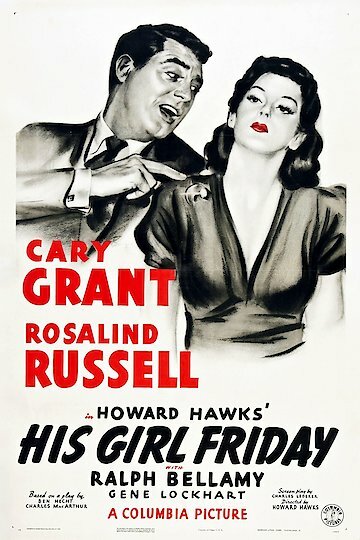 His Girl Friday is currently available to watch free on Tubi TV, Popcornflix, Viki and stream, download, buy on demand at Amazon Prime, EPIX, Amazon, FlixFling VOD, Vudu, Google Play, iTunes, YouTube VOD online.